This complex, energetic, and seductive port city, which stretches south-to-north along the Rio de la Plata, has been the gateway to Argentina for centuries. Portenos, as the multinational people of Buenos Aires are known, possess an elaborate and rich cultural identity. They value their European heritage highly--Italian and German names outnumber Spanish, and the lifestyle and architecture are markedly more European than any other in South America. One of the world's finest opera houses, the Teatro Colon, flourishes here on the plains alongside the river. Portenos are intensely involved in the life and culture of their city, and they will gladly share the secrets of Buenos Aires if you lend an ear and relate your own stories in return. Buenos Aires' physical structure is a mosaic as varied and diverse as its culture. The city has no dominating monument, no natural monolith that serves as its focal point. Instead, Buenos Aires is composed of many small places, intimate details, and tiny events and interactions, each with a slightly different shade, shape, and character. Glass-sheathed skyscrapers cast their slender shadows on 19th century Victorian houses; tango bars hazed with the piquant tang of cigar smoke face dusty, treasure-filled antique shops across the way. The city's neighbourhoods are small and highly individualized, each with its own characteristic colors and forms. In the San Telmo district, the city's multinational heritage is embodied in a varied and cosmopolitan architecture - Spanish Colonial design couples with Italian detailing and graceful French Classicism. 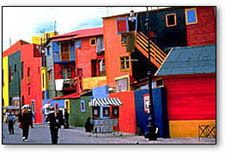 La Boca's pressed tin houses are painted a rainbow of colors, and muralists have turned the district's side-streets into avenues of color. For all its diversity, the elusive spirit of Argentina as a country is present everywhere in Buenos Aires. The national dance, the tango, is perhaps the best expression of that spirit--practiced in dance halls, parks, open plazas, and ballrooms, it is a dance of intimate separation and common rhythm, combining both an elegant reserve and an exuberant passion.